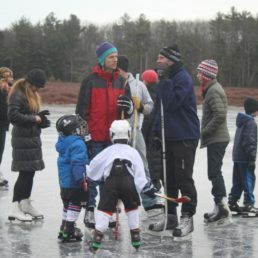 Owned and managed primarily by the Towns of Cumberland and North Yarmouth, the 334 acre Knight’s Pond Preserve is popular for ice skating, bird watching, fishing, dog walking, mountain biking, trail running, snowmobiling, hunting, and more. Located less than a mile from the town centers of both Cumberland and North Yarmouth, the preserve includes most of the shoreline of a 46-acre pond, a large block of forestland, a network of trails, and critical wildlife habitat. The trail networks at Knight’s Pond and Blueberry Hill allow visitors to check out Knight’s Pond or follow trails into the woods through oak-hickory forests and alongside vernal pools. Trails crossing Blueberry Hill and Bruce Hill provide for some nice elevation changes. A network of color-blazed trails (white, blue, red, and yellow) as well as a snowmobile trail across the property allow visitors to explore this 334-acre preserve. A few other short spur trails provide trail connections and scenic views. The snowmobile trail on the powerline is not yet improved for summer use; expect long stretches of muddy ruts if you attempt to circumnavigate the pond. The GPS address for the primary entrance point (parking, portable rest room) is 477 Greely Road Extension, Cumberland Center, ME. The secondary entrance is at the very very end of Greely Road Extension. From Cumberland Center follow Route 9 North for 1 mile. Turn left onto Greely Road Extension and continue for 1.3 miles. The two preserve entrances are at or near the end of the road. From North Yarmouth Town Center follow Route 9 South for 1.6 miles. Turn right onto Greely Road Extension and continue for 1.3 miles. The preserve entrances are at or near the end of the road. The trailhead at 477 Greely Road includes a large gravel parking area and a portable toilet. The trail between the parking area and the Pond is an old gravel road ideal for baby carriages and gentle strolls — wide and flat with occasional small ruts. Most trails on the Preserve are primitive, with rocks and roots. Beginning in early Spring you can see Ring-necked Ducks, Mallards and Canada Geese on the shores of Knight’s Pond. There are also Yellow-rumped and Palm Warblers starting at the end of April and the beginning of May. This bird rich habitat is a joy to visit. For more information visit: The Best Birding in the Royal River watershed. Knights Pond is also considered an eBird “hotspot” with 80 species identified. For more information, visit eBird’s website. The Preserve has a rich variety of habitat, including a rare Oak-Hickory Forest, and many significant Vernal Pools which provide breeding habitat for salamanders, frogs, and more. 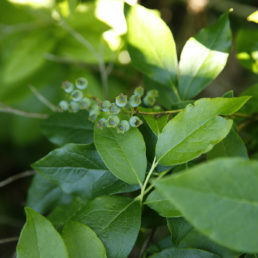 While Oak-Hickory Forests are common on the eastern seaboard, Knight’s Pond is one of the northernmost examples of this type of forest with blueberry undergrowth, scarlet tanagers, and other delightful features. This map shows the location of the Oak-Hickory Forest. This seven page document from the Maine Natural Areas Program describes the ecology of the Oak-Hickory Forest, the vernal pools, and other wetlands on the Preserve. The Preserve is owned by four different entities; please respect any and all posted rules of the Town of Cumberland, Town of North Yarmouth, FAA, or Royal River Conservation Trust. The preserve is open for hiking, mountain biking, and equestrian uses. Snowshoeing and back-country skiing are permitted, though trails are not managed or groomed specifically for these uses. Safe and responsible hunting on the Preserve is encouraged. We promote safe hunting experiences and protect deer by educating users of the hiking trail and their dogs to be respectful of hunters and deer during season, including winter deer yard season. As a courtesy, please call RRCT to inform us if you plan any trapping on the parcel. Hikers should always wear orange during hunting season, on all hikes. Bird hunting including waterfowl is allowed; please find sections of the pond away from trails as a courtesy. Please be respectful of all abutting private lands. Contact RRCT, CCLT, The Town of Cumberland, or the Town of North Yarmouth with questions about the evolving plans and activities at the preserve. The Preserve was opened to the public on October 22, 2015 after a campaign and conservation acquisition of 215 acres. Located less than a mile from each of two town centers, the preserve includes much of the shore of a 46-acre pond, a large block of forestland, a network of trails, and critical wildlife habitat. In the Spring of 2016, the Town of Cumberland acquired one small adjacent woodlot, expanding the preserve. An adjacent 76-acre federal parcel (FAA) with conservation easements completes the 300-acre conserved landscape. 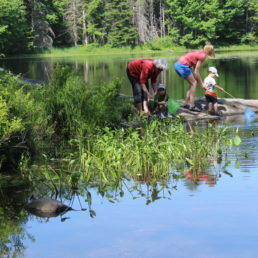 In 2018, the Town of Cumberland and the Royal River Conservation Trust each acquired parcels on the eastern shore of the pond, setting the stage for even more expansions. RRCT’s new parcel is known as “Baston Forest,” with a plaque honoring the long-time ownership of the parcel by the Baston family. In 2019 and 2020, the Royal River Conservation Trust, the Town of North Yarmouth Planning Board and other parties are actively considering trail connections to North Yarmouth village center. Most of the preserve is owned by the towns of North Yarmouth and Cumberland, and protected by conservation easements held by the Royal River Conservation Trust and the Chebeague and Cumberland Land Trust. FAA and additional Royal River Conservation Trust ownership is mapped and managed as if part of the Preserve. The Towns of North Yarmouth and Cumberland have adopted a management plan that guides the future of the Preserve. Many future decisions under the management plan will be overseen by the two-town Joint Standing Committee. 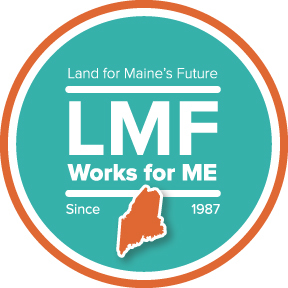 Funding for the initial $1.13M conservation acquisition project came from hundreds of local private donors and members of the Royal River Conservation Trust and the Chebeague & Cumberland Land Trust, the property taxpayers of Cumberland and North Yarmouth, the Land for Maine’s Future program, USFWS NAWCA, private foundations, and more. Project support was provided by The Trust for Public Land, a remarkable land conservation organization.